“If a creative and artful cook invents something and calls it pie, I’ll call it pie.” – Sue Hubbell, writing about Nantucket Cranberry Pie in “The Great American Pie Expedition”. For the visual, here’s a fresh-out-of-the-oven Nantucket Cranberry Pie I baked two days ago. When the March 27, 1989 issue of The New Yorker came out, my son Sam was only six months old, and as that issue used to sit on top of a stack of other The New Yorker issues in a crate next to the refrigerator, “The Great American Pie Expedition” was very conveniently placed as a cookbook. Nantucket Cranberry Pie wasn’t the only one of the recipes I had tried — “Shaker Lemon Pie”, for example, was interesting but didn’t really grab me — but it was the recipe I kept baking over and over again. 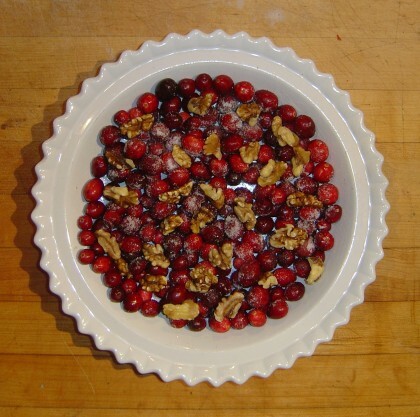 It was very simple to make — basically a bag of cranberries sprinkled with sugar and walnuts, and then some sweet batter spooned on top — an ideal use for your stockpiled bags of frozen cranberries. About six years later we moved to our current house, and that The New Yorker issue with its bell-ringing bunnies has not been seen since. Thoughts of Nantucket Cranberry Pie gradually passed from my mind, and it was only a few years ago that I made a try at recreating it, looking for recipes online that seemed more or less similar to what I remembered. 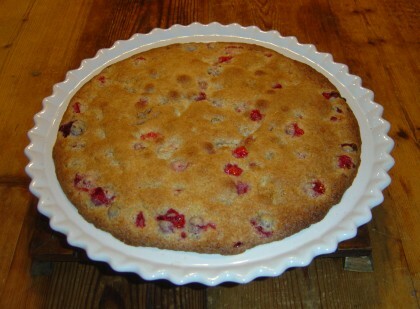 Even more recently, I did find the recipe again online, and as you can see from the pictures, just baked one up using one of the many post-Thanksgiving bags of cranberries in the refrigerator. Where cranberries grow by the bucket. Now there’s none left to eat. Please bake one more pie from Nantucket. You can do it right now, you know, because you can read both the recipe and Sue Hubbell’s story about it online, in Google Books’ preview of From Here to There and Back Again. Yes, soon you too can have cranberries bubbling away in your oven just like this.